Scott Himelstein speaks before OB Town Council and questioning audience. Nearly every chair was filled last night at the OB Town Council monthly general meeting. Many of the some thirty folks in the audience had come to hear Scott Himelstein speak about his group’s “reform” plans for City schools. Himelstein had invited himself to deliver another spiel about “San Diegans 4 Great Schools” and was the night’s guest speaker. The group is going around town in an effort to get their message out to community groups. OB was the second stop on Himelstein’s rounds. Last week he had been in Tierrasanta. After describing his group as a “coalition of businesspeople, parents, teachers and philanthropists”, Himelstein gave his pitch: the schools are failing, they have troubling results, money per student is rising, and it was time to examine how to build in greater accountability in the governance of the School District – one of the largest in the state. His big line: “the system of governance has not changed since 1931.” “It was time to evolve,” Himelstein explained. He downplayed one of his group’s ideas for change: have a special committee appoint four new seats to the School Board, which currently has five members – each elected from their districts. 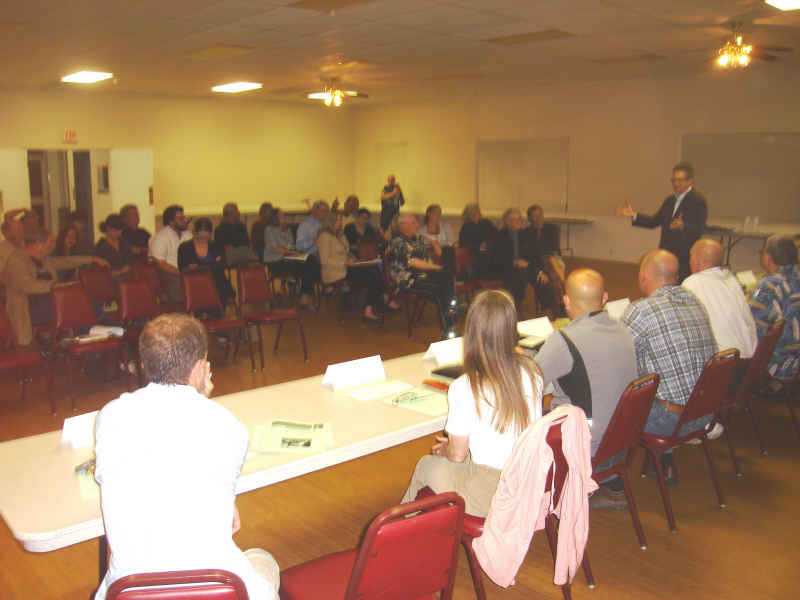 Once Himelstein had finished, Council president Jim Musgrove asked for questions – and the hands shot up. And for the next half hour, Himelstein fielded queries that were not that sympathetic to his message. Himelstein complained that the School Board had become politicized and resisted any changes to the numerous superintendents’ ideas over the past half decade. Doug Porter challenged him and his figures because they didn’t take into account the charter schools the District funds. Himelstein said he stood behind the numbers in the report. Others asked if the group had looked at private school scores and enrollment stats. Himelstein acknowledged that although public school enrollment was down 11%, private schools were down 22%, but charter schools were up 60%. Himelstein kept floating the figure of 90% – the percentage of district monies spent on salaries and benefits of teachers and other employees. He was asked what other districts spend in comparison, and he did say it was not that unusual to see those numbers in large school districts. This led me to ask Himelstein about other members of the group, that since it included billionaire Jacobs from Qualcomm, Danmeyer – who funded the study – a venture capitalist, and Cushman – a guy who built an empire from car sales, wasn’t the group and its effort an attempt by San Diego’s establishment to change the Board and wasn’t their effort also politicizing what they describe as an already politicized board? Himelstein simply responded that those were my views. Frances Zimmerman – a former District Board member – and Bernie, a District information officer, were also in the audience and both raised good points that test scores were gradually improving among District students. Here is Emily Alpert’s version, of Voice of San Diego. HooBoy! Was that a meeting or what? I was very pleased at the intelligent questions the audience was asking. What was most telling about Himelstein’s answers was his inability to put the group’s aims into words that went beyond platitudes about “governance” and “crisis”. The group’s refusal to actually work with the School District (and teachers, union or not), their willingness to distort statistics (i.e., why was data from 2009 left out? it’s been available since mid-May) and their wall of secrecy should be enough to give any thinking participant in education reason to doubt their intentions. Thanks for noticing! I wanted to say more but had to rush out of the house for a doctor’s visit. I wanted to add that the audience was mostly salt and pepper in their hair color. Not just their comments to Himelstein. I hope someone hangs onto the issue of the funding sources within the coalition. There is a story in there that the public needs to hear. thanks for the report Doug. Uh, excuse me? Miz Anna? I just read your piece in the OB Rag about San Diegans 4 Great Schools while I was doing a little research. In the process, I emailed a person listed on their page of supporters with whom I happen to be FB friends. I emailed this person to ask what SD4GS’ position was on the parcel tax. And he emailed back to say that he is not affiliated with the group. He said he went to their website over a month ago and signed up to receive a news letter and ended up listed as a “supporter.” He has contacted their webmaster asking to be removed, and they haven’t done it. Usually “reformers” are complaining that so much is spent outside the classroom on so-called “bloat.” Here we see we are actually spending most of our money to put teachers in classrooms and now that’s a problem? Thank you for sharing your Facebeook friend’s concerns about those who are listed as supporters of San Diegans 4 Great Schools. I’m the person who gathers the names and posts them on the site. We only list names of people who have given us permission by expressly saying so or checking the “I support San Diegans 4 Great Schools” box on our website (which is a check box above the one to click to receive e-mail updates). I have not received a request from anyone to have their name removed from our site. If you could please let your Facebook friend know that if someone would like their name removed to please contact me at jen@sd4greatschools.org. the info has been passed along. thanks for taking the time to comment. I am continually amazed that USD (Where money can be hidden because it is not a public college) emerges as the place where EDUCATIONAL REFORM as crazy as this is concieved. I guess if you are living off of contributions from the rich, you can proffer their ideas as reform. Shame on Scott, shame on a potentially responsible college for taking sides. CHANGING THE COMPOSITION OF THE BOARD has nothing to do with student performance, and even looking at national research (which a college should do) one finds no significant benefits from non union or union districts. This is not about student achievement …but about taking away the power of the electorate when they vote for a board that Himmelsteins backers dislike. He is nothing but a paid gunslinger for the rich hiding in a secretive private college’s protection. A large portion of the audience was either suspicious or hostile to the notion of a business groups involvement in the schools. Perhaps they would be happier if the business community ignored public schools and focused their attention on private schools. I would suggest that Mr. Himelstein would fine a much more receptive audience if he spoke to the parents of high achieving Seminar and Gate parents who have students bored by the easy of our public school system. RB – were you there? I don’t feel comfortable with big business running our public schools, do you? Hey, I’m a parent of a high achiever, and it’s certainly true that there are problems, but bringing in the corporate model, which Bersin tried, is not the way to go. Here is a link to Voice of San Diego’s Emily Alpert’s version. I don’t support any adult group with an agenda other than a complete focus on the students. I strongly support individual adults who are teachers and principals. There are many corporate models and many models for non-profit organizations. I do in general support a type of the Nordstrom model of management (This is not a top down only model). Every manager above an employee MUST support each employees attempts to succeed. In this District, the managers above the individual schools provide too little support and provide too many hurdles to success. I would like the Cluster model in Point Loma to continue to grow. I like President Obama’s reforms and like the idea of an area charter with a way for students outside of the area to still receive bus transportation. Given it’s history as a teacher’s college, and the rate at which they continue to churn out today’s teachers, I would be much more interested in seeing the results of an SDSU study on the matter. No offense to USD, but the SDSU teacher education and credential program is FAR more plugged into the SDUSD, and in a far better position to highlight the shortcomings of the district and investigate solutions to the many problems therein. I also agree with the sentiment that giving too much control of our school district to corporate interests is a VERY bad idea, although there’s no doubt that honest brokers will surely have something constructive and useful to contribute to the discussion. They should not be dismissed entirely. But it is imperative to include more career educators into the discussion–they’re the ones on the front lines, so to speak, and thus they’re the ones who REALLY know what’s going on. Teachers and principals are the ones that need to be consulted. They’re the ones that best know what their schools need to make it function better, and every school is going to be a bit different given the different demographic makeup of their respective communities.